There’s a lot of reasons we want to go back in time right now – to escape the current political climate, to turn back the clock on our actual climate, and, of course, to bring back the killer looks. Since its inception in 2015, Italian label Corelate has taken inspiration from contemporary culture, so it makes sense that its latest collection draws on our present nostalgia for previous decades. Inspired by the shapes, colours, and textures of the 80s, the collection harmoniously merges modern streetwear with the bold eccentricity of the past. 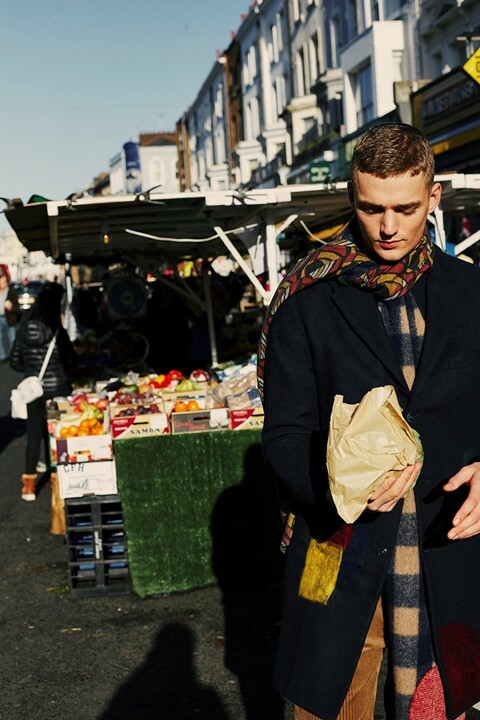 Shot in London, the lookbook sees models leisurely browsing the sunny market in bright scarves and smart shirts, casually snapped by shadowed figures, before presumably rushing off for a creative business meeting. Corelate’s designer Maurizio Tedeschi draws on both the functional formality of 80s power dressers, as well as the unconventional aesthetic of the punks for AW18. The pairing of street codes, including hooded jackets and bucket hats, with workwear items, such as collared shirts and briefcases, returns us effortlessly back to the present day. The collection adds a twist to the traditional, from jersey sweatshirts with raw-cut bottoms, and smart wool coats reinterpreted with coloured patchwork, to tailored trousers in a variety of materials. For the first time in its winter collection, Corelate has introduced new shoes, offering their take on the bright and incredibly comfortable ‘dad’ sneakers we’re still so obsessed with. Our blue sky market days might be over for now, but Corelate’s AW18 collection will keep you warm and looking sharp until the sun manages to claw its way back out. Corelate’s AW18 collection is available now.